Google Maps tiles have been available in South Africa for a while already, so what's actually new? The map data has been improved dramatically and is now available with additional features. As well as searching online Maps, Google Maps users can now find businesses and check driving directions. Businesses can also add their own business listings for free via Google Maps Local Business Centre. Not only the big cities such as Johannesburg, Cape Town, Durban, Pretoria, and Port Elizabeth are included but also smaller towns, from Kimberley and Polokwane to Graaff-Reinet and Margate. All this information is now accessible on Google Maps through any web browser or via Google Maps for Mobile on data enabled handsets, meaning that people can find information while they're on the move, too. 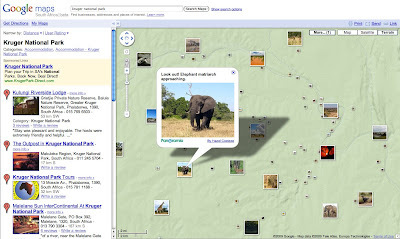 Another popular feature is My Maps, via which users can add their favorite locations and destinations to Google Maps. We've already got some great My Maps content for South Africa including more than 60 favorite spots of local celebrities and artists such as Thandiswa Mazwai, Freshlyground and Desre Buirski, and popular blogger Mushy Peas on Toast. 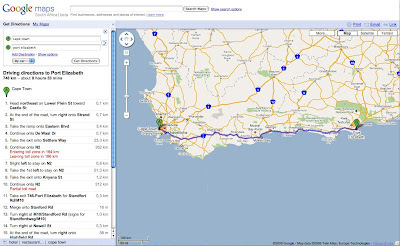 With greatly improved map coverage for South Africa, many more uses of online maps will start to appear, especially in the run-up to the 2010 FIFA World Cup™. With Google Maps, users can choose accommodations, get to know the area they're visiting and avoid getting lost using Driving Directions. South African businesses can also raise their profile by making information about their services easily accessible. They can even use My Maps to list their outlets and points of sale. Maps are also invaluable for governments, NGOs, universities and entrepeneurs, who can visualise, plan and market the areas and projects that they work on. We hope that both local and global users will start to enjoy the benefits of Google Maps straight away. Sur les cartes figurent non seulement des grandes villes telles que Johannesburg, Cape Town, Durban, Pretoria et Port Elizabeth, mais aussi des villes plus modestes telles que Kimberley, Polokwane, Graaff-Reinet et Margate. Toutes ces informations sont maintenant accessibles sur Google Maps avec n'importe quel navigateur, ou via Google Maps for Mobile sur des mobiles pouvant recevoir des données. Les gens peuvent ainsi trouver des informations même lorsqu'ils sont en déplacement. Autre fonction très appréciée : Mes Cartes, qui permet aux internautes d'ajouter leurs propres lieux et destinations préférées à Google Maps. Nous possédons déjà du contenu Mes Cartes très intéressant concernant l'Afrique du Sud, et notamment plus de 60 lieux préférés de célébrités et d'artistes tels que Thandiswa Mazwai, Freshlyground, Desre Buirski, et le bloggeur populaire Mushy Peas on Toast.